Nature can be understood through systematic study. Scientific ideas are open to revision. Sound scientific ideas withstand the test of time. Science cannot provide answers to all questions. strive to increase their understanding of the natural world. Laws of nature are expressed as scientific laws. A scientific law is a statement that describes what always happens under certain conditions in nature. starting point for new ideas about the natural world. detailed understanding of the natural world. found to be true. You will learn about many of them as you study biology. Did life on Earth evolve over time? Was life on Earth created through another method? could be a matter of belief. Therefore, it is outside the realm of science. for asking questions and testing possible answers. It generally follows the steps listed in Figure below. 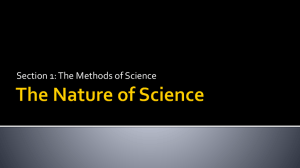 See http://www.youtube.com/watch?v=KZaCy5Z87FA for an overview of the scientific method. Steps of a Scientific Investigation. 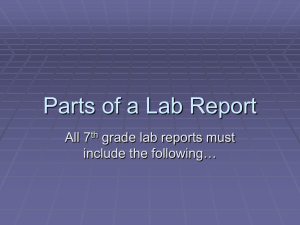 A scientific investigation typically has these steps. make it look like an owl’s face. What reason might there be for this observation? prey on other birds. From this knowledge, you reason that eye spots scare away birds that might eat the moth. birds will avoid eating it. moths. This evidence agrees with your prediction. examine all of the possible evidence, and someday evidence might be found that disproves the hypothesis. Nonetheless, the more evidence that supports a hypothesis, the more likely the hypothesis is to be true. they add support to the hypothesis. However, if they get different results, they may disprove the hypothesis. ways to avoid this error in future studies. A laboratory experiment studying plant growth. What might this experiment involve? 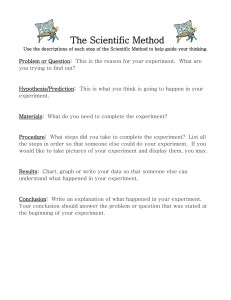 The sample in an experiment or other investigation consists of the individuals or events that are studied. evidence in the natural world, such as fossils that the extinct animal left behind. in the real world than an experiment does. Another way to gain scientific knowledge without experiments is by making and manipulating models. know what systems these two models represent? models. Models of very complex systems are often based on mathematical equations or computer simulations. observations, however, it doesn’t prove that the model is true or that it is the only model that works. over and over again, and it must be supported by a great deal of evidence. knowledge is based on evidence and logic. 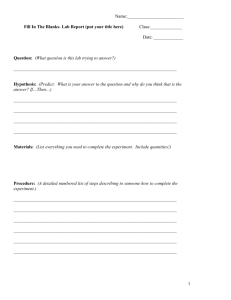 for asking questions and testing possible answers. often done in a lab. when experiments are difficult to do. they are supported by a great deal of evidence. 1. What is science? What is the goal of science? 2. 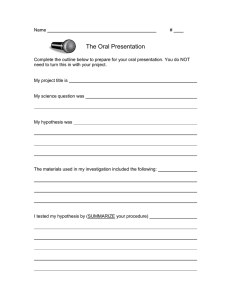 Outline the steps of a scientific investigation. 3. 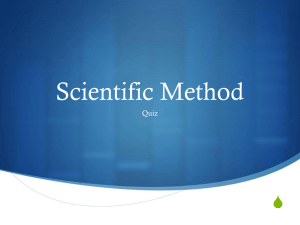 What is a scientific hypothesis? 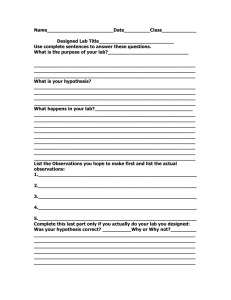 What characteristics must a hypothesis have to be useful in science? example of scientific question that could not be investigated in this way. 5. What might be an advantage of collecting evidence in a natural setting rather than in a lab? 6. What would be 2 constants (controlled variables)? were present on each type of gel. 7. Explain why science cannot provide answers to all questions. 8. Contrast how the term theory is used in science and in everyday language.